It has been a couple weeks since I did a post about beer, so I thought it was about time for something aimed at my chief demographic. When I took a vacation up to Massachusetts in August to visit my parents I got in my only brew of the summer. I wanted to make it count, so I went with a complex mash, 4 hour boil, and a zany assortment of bugs. 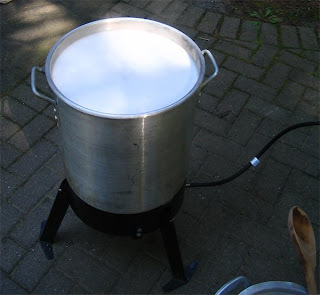 The 3 lbs of wheat and 1 lb of the pils were mixed with 4 gallons of 150 degree water, the mixture stabilized around 140 degrees. 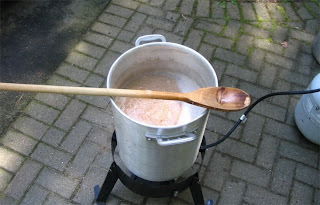 This thin grain soup was then slowly brought to a boil and held there for 30 minutes to gelatinize the starches in the unmalted wheat. Gelatinization means bursting the starch granules (in this case so the barley malt enzymes can access them), this concept is the reason you need to boil a sauce after you add flour to get it to thicken. Once the cereal boil was over I added the remaining 6 lbs of pils malt, along with 2 gallons of cool water to bring the mash down to a high Saccharification rest of 158. This high mash temp ensures there will be lots of dextrins. 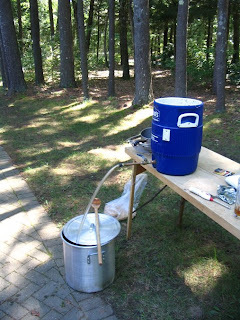 I left the mash in my 7.5 gallon "sparge kettle" because there was too much for my 5 gallon mash tun to handle. After holding the mash at 158 for two hours I transferred it from the kettle to my mash tun, at first using the leftover liquid from the mash, followed by 4 gallons of 200 degree water, enough to net 9 gallons of wort. The hotter than normal sparge helps to get a high degree of extract (about 91% in this case), including the starches and dextrins that the wild yeast and bacteria need. A sparge that causes the grain bed to go over 170 is not done in most styles because it leaches astringent tannins from the husks, but with several years of aging the tannins in a Lambic will bind with other proteins and settle out. As you can see I was pushing the limits of my 10 gallon boil kettle. 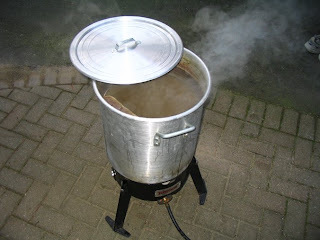 Luckily I was brewing outside so the small boil over I experienced didn't make much of a mess. 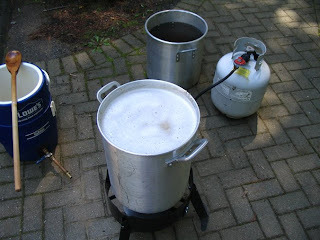 The boil was the longest I have done so far at 4 hours. This long boil helps to concentrate the large volume of wort, drive off the nasty aromatics for the aged hop (although I used 3 oz of relatively fresh, but extremely low AA% Hallertau Select), and coagulate and drop some of those tannins. Finally after the wort boiled down to about 5 gallons, I chilled it, strained out the hops, and pitched my yeast and bacteria. The first Lambic I brewed got just the Wyeast Lambic Blend, and is pretty tasty, if a bit bland. So this time I decided to use the Wyeast blend as a base, which I augmented with the dregs from a bottle of 2004 Drie Fonteinen Geuze (probably my favorite Lambic), and the remainder of the Russian River Oak Chips (around 1 oz). My first attempt at Lambic took about 4 days to show any sign of activity, this time after 4 days the krausen had already risen and fallen. I will probably transfer this one to secondary in December and dilute it with a bit of water to bring down the gravity and get it off the remains of hop pellets. 3.00 oz. Hallertauer Select Pellet 1% AA @ 240 min. 8/13/08 Brewed with a drop by from Mat during the boil. Wheat was raw Arrowhead Mills Wheat Berries, ~15% protein. Used bottled spring water. Wyeast mash, poor temp control (started a bit too hot, then between 149-158) since it was too big to fit in the cooler. 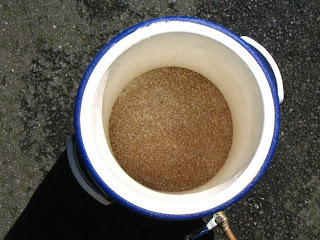 Transferred malt to mash tun after 100 minutes at Sacch temps, some liquid remained to add to sparge. Huge gravity 1.070 ~5 gallons, hops added at start of 4 hour boil, pitched dregs of 2004 Drie Fonteinen Geuze + Wyeast Lambic Blend + Russian River chips, ~72 degrees. 8/17/08 Small amount of blow-off through the airlock and fermentation dying down, just good to see fermentation going well so much sooner than my first attempt. 12/26/09 Good funky aroma, and already has more sourness than my first lambic. Hopefully it will be ready to go by next summer. I left it as is, but will probably dilute it before bottling, but that will depend on how it tastes. 6/28/09 Bottled half the batch with 1/3 cup of cane sugar. Racked the other half onto 2 lbs of sweet cherries and 1.5 lbs of raspberries. 8/19/10 Finally got around to doing a tasting, pretty tasty, but too big and lacking the sourness required of a Lambic. 10/14/10 Bottled the fruited portion (~2.5 gallons) with 2.25 oz of cane sugar and some champagne yeast. 12/25/10 The cherry-raspberry version turned out pretty well, good fruit character and plenty of funk. Better balance than the plain, but the fruit and funk clash a bit. What's the benefit of a 2 hour mash? Especially since it was on the higher end of the temp. range. I might have it backwards but aren't high temp. mashes quicker than low? You are correct, higher mash temps do promote a faster conversion. However, this mash was very thin (~2.4 quarts/pound) meaning that the enzymes are more dilute and will take longer to do their job. In addition the longer Saccharification time is needed because 40% of the mash was boiled denaturing any enzymes it contained (the unmalted wheat doesn't contain the right enzymes anyway). All that said, you probably are correct that it may have been done sooner, but what is an extra hour of waiting for a beer I won't be drinking until 2010 or 2011? Well, that makes sense. Now I wonder what's the longest mash time you've ever done? Assuming that 2 hour mash wasn't the longest. My Liquor Spiked Barleywine had a Sacch rest around 4 hours. In that case I started the mash on my lunch break, and sparged after I got off work. I was looking to make a well attenuated beer so the long mash wasn’t an issue, I would not try this long of a mash if I was looking to do a sweet beer. I know some people do overnight mashes with good results, but I have yet to attempt one. 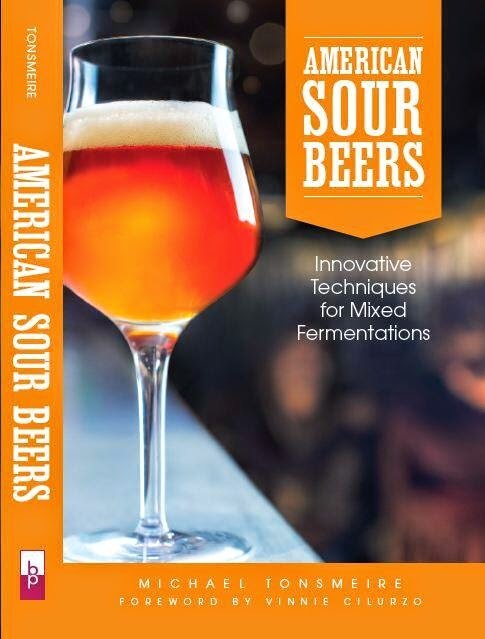 I do many sour ales. 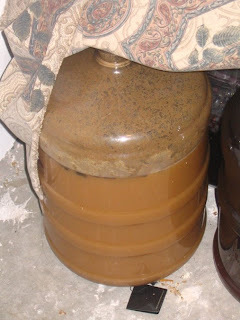 I have two 53-gallon barrels in my basement, one full of Flanders red-style (vinegary, dark, somewhat malty, with God know what bugs) and the other "regular" (B. bruxellensis, WLP655, and other bugs picked up over the years). Both are very popular with both homebrewers and "civilians". I do primary in buckets and secondary in barrels to avoid a mess. I top the barrels off every few days to compensate for evaporation. Whenever I remove some for kegging, I replace it with an equal amount of fermented wort. I am currently growing some Lactobacillus delbrueckii, and also Drie Fonteinen Oude Geuze dregs, for future use. 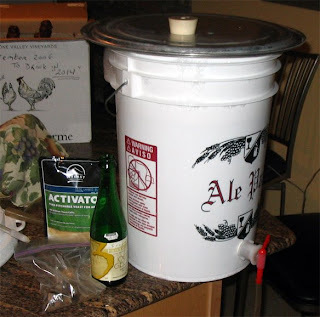 I did not aerate as I've heard that lacto, etc can reproduce without it, plus oxygen encourages Acetobacter. Any suggestions on their care and use?